There was a bit of moaning when Farsight's ability to take crisis suits as troops was "lost" in the Codex update and Kauyon books. But with Mont'ka, it's back. Farsight's Dawn Blade Contingent is able to take a Retaliation Cadre as his core formation. Tack that onto the "Eight" as your Command Choice, and maybe a Rapid Insertion Force or a Drone-Net full of BS-3 Marker Drones for your Auxillary, and Boom.... Jetpack JSJ goodness all over the place without the need for pathfinders. Yeah, that's right. 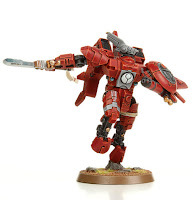 The Big Red Battlesuit Boys are back. This is my problem. Will Farsight take Optimal Invisible Force in auxiliary? Leaked images suggest yes images are incomplete.